Preheat oven to 375° F. Marinate treviso in olive oil, salt and pepper about 10 minutes. Beat eggs, cream and fontina together in a bowl. 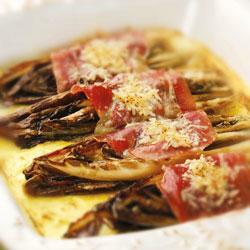 Wrap each piece of treviso with a slice of proscuitto and place in shallow baking dish. Pour cheese mixture over top and sprinkle with Parmesan cheese. Bake until egg and cheese mixture sets, about 15 minutes.